Friday is usually house shopping day, when the store cupboard is replenished and the weekly menu is planned (everyday is a military operation in this house!!). But the usual routine went out the window when I found myself housebound with a sickly small one, who didn’t want to go anywhere near a shop. This is when it pays to be resourceful, so I scoured the cupboards to see what I could find (which are generally pretty well stocked, but were looking a bit thin on the ground). I’m convinced that the more skint I get; the more creative and resourceful I become…I think we have a tendency to stop thinking when we are earning plenty, we have the resources to just go and buy and don’t put so much effort in to making things at home, or drawing on whatever resources we have tucked away inside us. I, on the other hand am earning hardly anything these days, so I have to do lots of thinking. Apart from the teen complaining that she can’t have everything right NOW, we don’t do too badly….making presents and cards, even home made bunches of flowers have become second nature…and we love it all the more for the effort and time that has been taken. 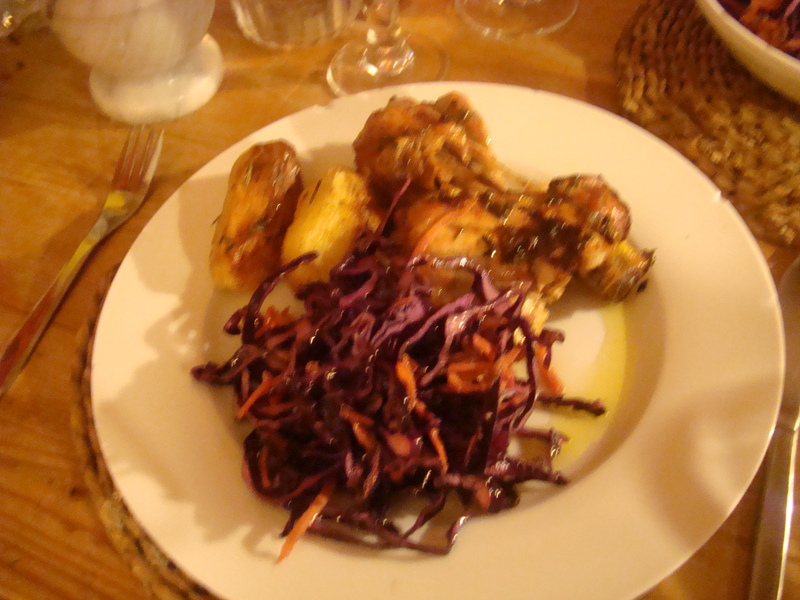 So back to supper and raiding the store cupboard….all I managed to find in the way of fresh food was some potatoes, half a red cabbage, some carrots, and a pack of chicken in the freezer. So, first I got the chicken out to defrost, which once done was marinated in olive oil, a clove of garlic, half a teaspoon of English mustard, some herbs (I used chives from my window sill, parsley, thyme from the garden…well my neighbours garden) salt, pepper and some lemon zest and juice (that used another one of my glut mentioned in my last post). Left for an hour or two I then put the chicken in a roasting tray and stuck it in the oven, gas mark 6 for about 50 minutes to an hour. In the meantime I part boiled some peeled potatoes for 5 minutes or so, tossed them in olive oil, salt and pepper, thyme, a sliced lemon and then roasted them in the oven too. I shredded the red cabbage and mixed it with grated carrots, chopped walnuts, raisins and made a dressing from 2 tablespoons olive oil, 2 tablespoons walnut oil, 1 tablespoon cider vinegar, 1 teaspoon honey and some salt and pepper and tossed it over. 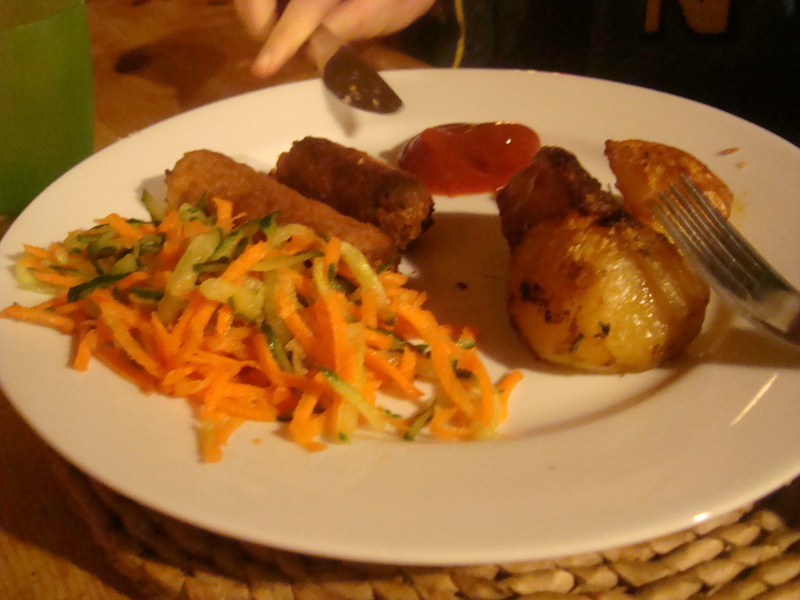 Voila, one healthy Friday supper (although the photo, rubbish as ever, doesn’t do it justice)….unfortunately the vegetarian teen wasn’t so keen and demanded her own ‘un-messed with salad’ which consisted of grated carrot and cucumber, no dressing and vegetarian sausages…can’t please ‘em all! !